History: Formed in 2008 as Linlithgow Climate Challenge (LCC), we first heard about Transition through an excellent presentation by Eva Schonveld at one of our inaugural meetings. Our first meetings helped to galvanise us into taking local action. We formed into predictable groups; Food & Gardening, Energy Saving, Renewables, Cycling, Allotments, Finance and Admin, Recycling, etc. Folks then focused on one or two sub-groups where discussions and ideas would develop. Successes: Several successful funding rounds with Climate Challenge Fund helped us on our way. We ticked the usual boxes that CCF funded groups do. Raising awareness, delivering projects, getting people involved, regular reporting, financial accounting, etc. At the peak we had several staff, an advice centre and a big list of projects. 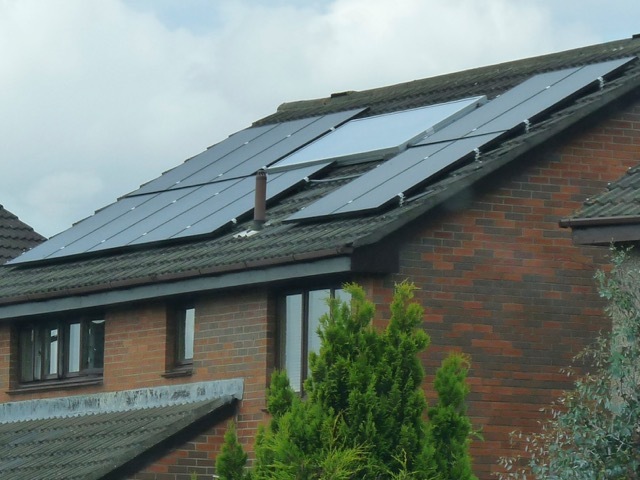 We helped hundreds of homes to fit loft and wall insulation, quite a few properties installed solar thermal and PV panels and heaps more started to eat locally, cycle more and recycle stuff. Challenges: Relying on short term grant funding is an impossible task. We could have continued but it was clear to our trustees that the 'tail was wagging the dog'. i.e. we were doing what the funders preferred to fit in with their criteria rather than us doing what we needed to do. This lead to an end of grant funding and a few years of still productive action, but without big finance. We realised we would eventually need to start social enterprises and generate real low-carbon jobs if the task of sustainability was to be embedded in our community from the core. Relying on grants wasn't a resilient model to develop. LCC became Transition Linlithgow and a registered Scottish Charity and with the end of funding it was important to move into a 'Pause and Reflect' phase. Going forward our vision has changed a little. We talk less about Peak Oil and Climate Change and more about Caring, Sharing, Resilience, etc. The language has altered. This has the advantage of opening access for others who want to participate but it also has an impact on the greener members who feel a bit of a loss of focus. Climate Change remains our big primary focus but how we deliver meaningful low-carbon living is about getting people to connect, to share resources, to value our local environment (land, air, water, wildlife) and to build deeper resilience through enterprises, co-operatives, local food production, local energy generation etc. Our vision has 3 themes. Caring - we need to care more about local things, local issues. air quality, loch water quality, pollution, soil quality, community health & wellbeing, etc. Sharing - we need to learn to share stuff and skills too. developing new mechanisms for repairing things, teaching each other new skills, etc. Building - creating new enterprises and co-operatives which will drive future change. Solar Co-ops, CSA's, Food Co-ops, etc. Building resilience through the imagination of new careers. Harvest Feast - Enjoying local food together on a Farm. LADAS - Linlithgow Allotment Society. 70plots. Finding time to network and talk to other groups. SQY. Our Transition Twinning group near Paris, France. 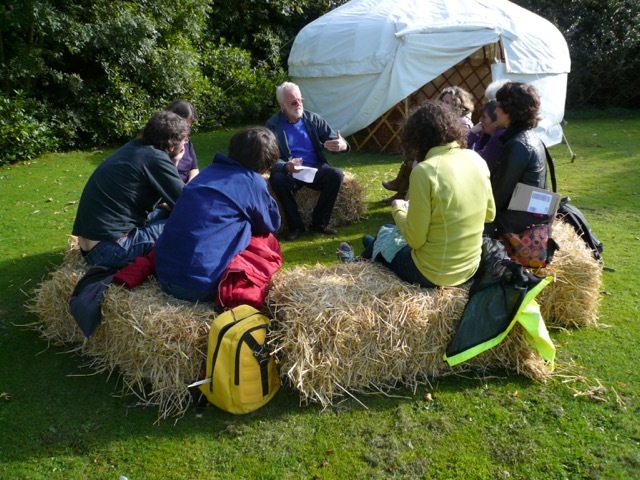 Sharing ideas on permaculture, community gardening, etc. Our very successful Solar PV and Solar Thermal project.